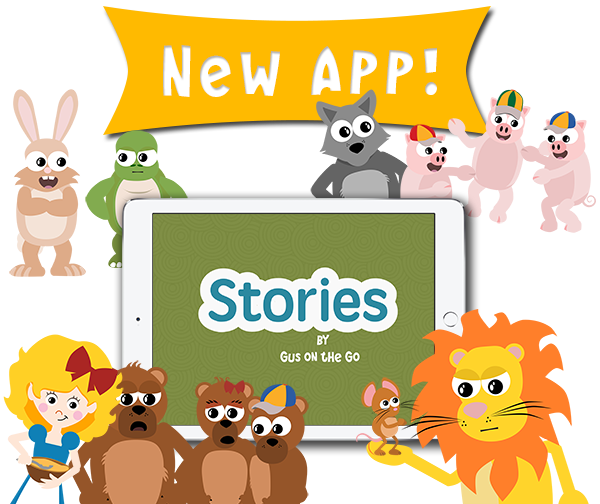 Explore French for kids with Gus on the Go’s original French vocabulary app and then dive right into stories in French with Stories by Gus on the Go. 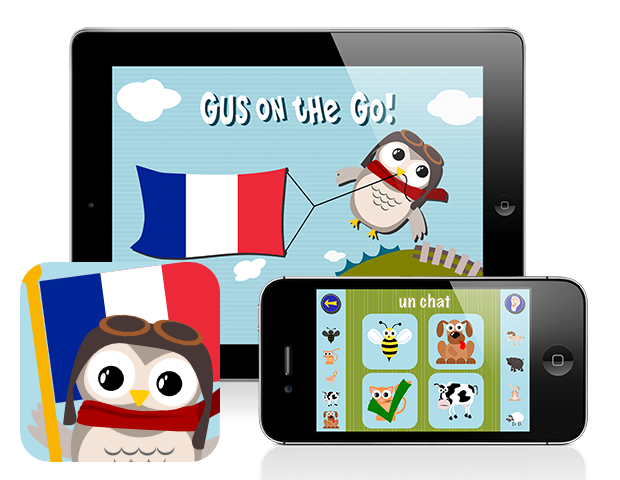 Our French apps for kids give you an immersive experience from the start. Gus couldn’t possibly make a trip around the world without visiting France and learning the beautiful language of French. Gus plans to make a stop in Paris, Lyon, Toulouse and Marseille. Speaking the language of love is a cinch with our native French speaker from Paris. Learn how to properly pronounce words in the following categories: animals, food, transportation, clothes, numbers and more. Our language app offers a comprehensive way of learning nearly 90 vocabulary words through interactive lessons and fun vocabulary games unlocked by completing engaging lesson reviews. Now available on the App Store! French is a classic romance language so it is important to include articles to indicate the gender of the noun when teaching vocabulary. Gus on the Go: French uses indefinite articles as children in France first learn words with indefinite articles. Please note that this created two strange grammatical cases- “a milk” (un lait) and “a cheese” (un fromage). While they are not commonly used, these cases are still grammatically correct. For the sake of consistency, we kept these in their indefinite forms. Already past basic vocabulary? Then dive deeper into the French language with classic stories with a silly twist. Meet the Lion & the Mouse (Le Lion & La Souris) One likes to sleep, the other likes to dance. It’s up to you to make them move, in French! I was looking for a French learning app for my two year old and this fit the bill perfectly. I really like that it has a native French speaker and no English translation, so it works like immersion into the language. Also, there are no ads or in app purchases. The graphics and animations are adored by my two year old and keep her engaged. In the beginning she didn’t understand the quizzes so I had to unlock a couple of sections for her but now she does it all by herself. This is our favorite French learning app and it works flawlessly on my iPhone 6. Truly an excellent app. Kids really enjoy learning French with it and they are motivated to move to the next level with lots of FUN! I got this app for my 2 year old daughter and she adores it. Thanks to the games, I realized that she understands much more French words than I suspected. I would definitely recommend this to any parents who wants their kids to learn French.